Posted 1:08 pm by Rena Anya Devéza & filed under Alexander Technique, Alexander Technique Teacher Training. We just had a March week-long break in Alexander Technique teacher training. And I had a few days off from work. Phew. Me, personally, I was zonked and I needed this break big-time. The weather was still pretty bad…really, really cold…snowy, icy and slushy. Tiring weather. Tom, my trainer, is having me to put hands-on my two other co-trainees for awhile now, in both table turns and now chair turns. They started the training together in September. Me, I’m more than half-way through my training. I work on them. They are not at the level yet to work on me. But me working on them…well this could possibly forge bonds among us. We are a tiny group…so…I don’t have many options for putting hands-on. I am so grateful for this opportunity to work on them, in other words, to work on myself, concentrate on my use of self… For me it is an exercise in concentration. I am delighted when they feel benefits from my hands-on. From time to time, Tom is also having me put hands-on the others as he works on them, so I can get a feel what is happening with them as their turns are progressing. This is fabulous for me! The other important thing is that I am now starting to lengthen spines by taking heads out. I practice both on my co-trainees and on Tom. You Alex Tech teachers know the drill for this: link hands under occiput, moving the hands incrementally, the hands need to come from “the outside” of the arms, from the back, from the feet, I have to concentrate on my own use of self…staying up up up, no tension in the inner arms, my back has to be back and away from my hands…while I am keeping contact with my hands on the other person’s occiput. I have to be vigilant of my own use. That is the most important thing, especially for this, well especially always! I must put hands-on with great sensitivity and care for this very important aspect of table work. During the week off I had one of my semester lessons with Tom…and it turned out to be a two-hour session. It hit me the next day that this lesson was just wonderful…a lesson like all my other lessons yet a distinctive lesson…a lesson apart. A stellar lesson. It was a validation…a yardstick measuring the continuing reliability of my sensory perception. We worked hard. I had my lesson proper. Then I put hands-on him. For the hands-on Tom, I took his head to lengthen his spine. I do have moments when things are really going well in doing this. I have my moments of really get it, and Tom says that these moments are coming more and more often. To hear this…well…it is beyond gratifying. Then, while he was sitting in the chair, I worked on his shoulders…just like “hands on back of chair.” And then we just wound up having an impromptu talk about training, the Alex Tech, et al. Afterwards I went a bit uptown to the Museum of Modern Art, had a wonderfully long lunch with a dear friend, and saw Rodin’s Balzac in the snow! I have always loved this statue in this space, the sculpture garden of MoMA. It seems that I have been visiting him all my life. He is such a dear friend to me! 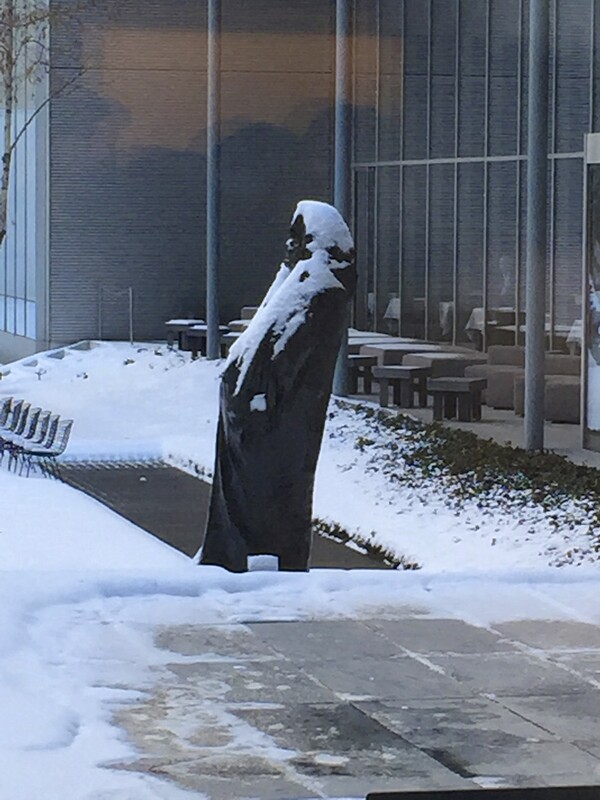 I thought that the snow became him! And now we are back in training…and I am on to new stuff. And it is warmer! Heat wave! Yay! Just the other day, while walking to training, well, I was pretty tired, but I did realize: “hey! it isn’t cold. What a relief!” And there was light! Daylight Savings Time had arrived. When I entered the big studio the light pouring in was exquisite.